What is Miatas at the Gap? 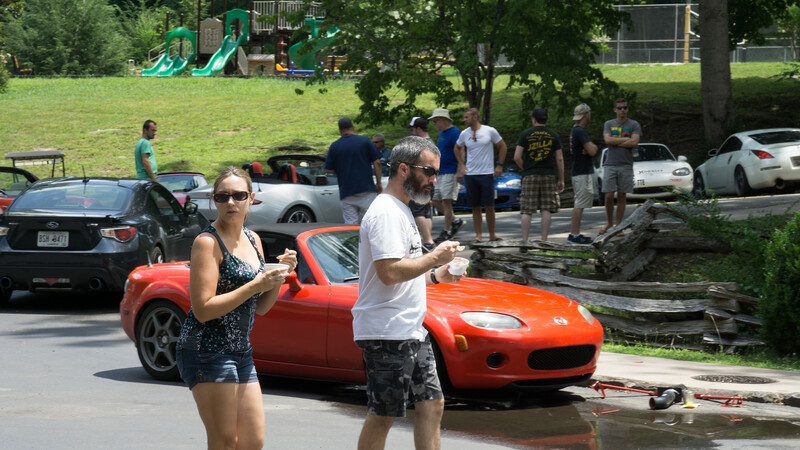 Simply put, MATG is THE longest running Miata gathering in the country. 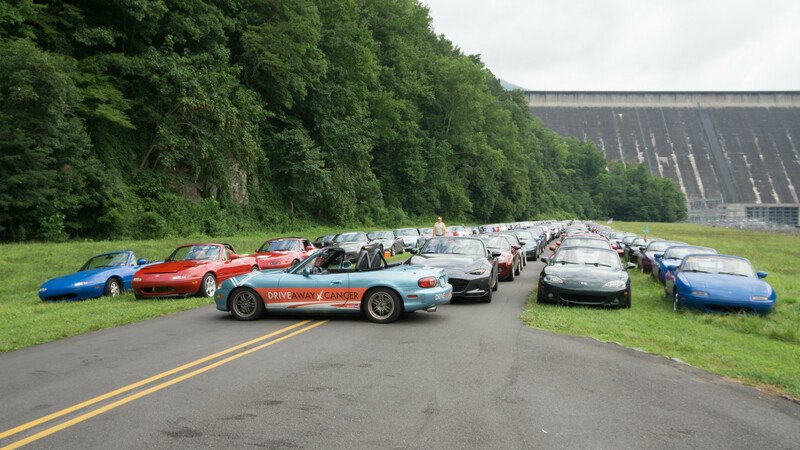 Located in the midst of some of the greatest driving roads in the country, we are one of the largest gatherings of Mazda Miatas and owners in the US. Attendees range from Miata newbie to 20+ year veteran and their vehicles from stock to Excocet/track rat and all forms in between. They come from all walks of life and some even come from other countries to attend each year. The cars were meant for these roads and the area doesn’t disappoint. Ground Zero for the event is the Fontana Village Resort (link, map) located in the middle of Miata driving paradise. 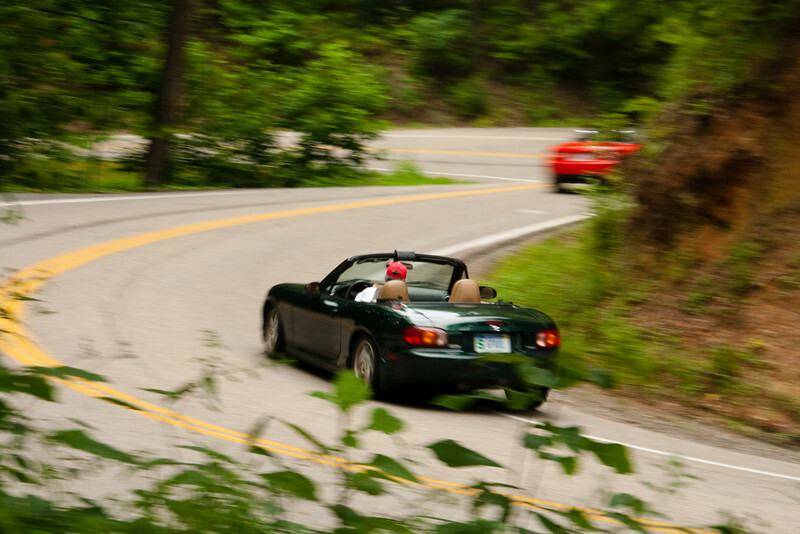 The main attraction for the Miata enthusiast is the legendary Tail of the Dragon. 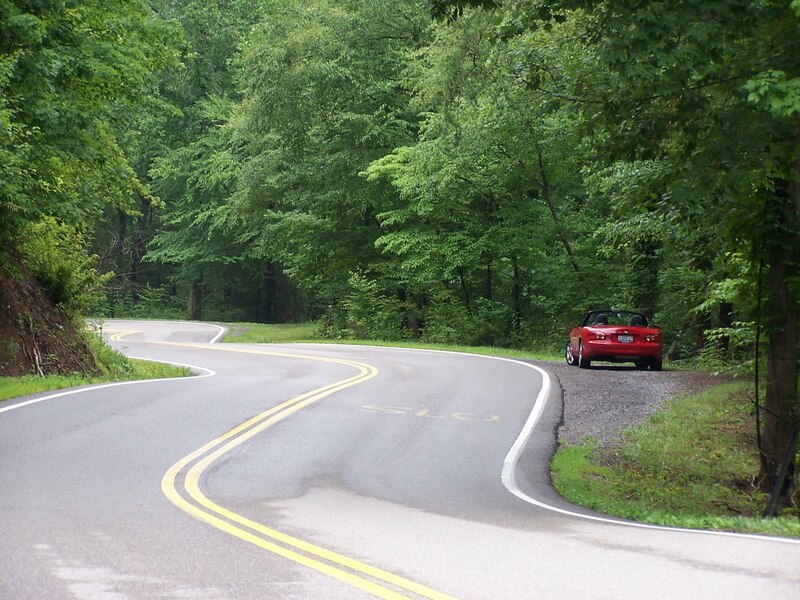 Being in close proximity to other options like Wayah Road, the Cherohala Skyway, Moonshiner 28, Devil’s Triangle TN, Six Gap in Georgia, and Diamondback 226A means endless hours and days of driving bliss. 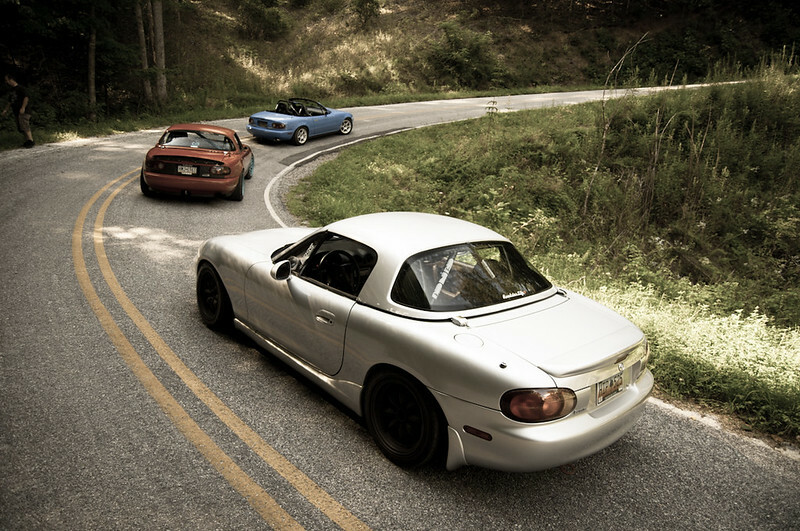 Miata, MX-5, Eunos Roadster, whatever you call it, the Mazda Miata is the most popular sports car ever made. With more than 1,000,000 built since 1989 and fans and enthusiasts the world over love to come together to enjoy great driving roads, make lasting friendships, and enjoy being a part of the greatest group of car enthusiasts around. 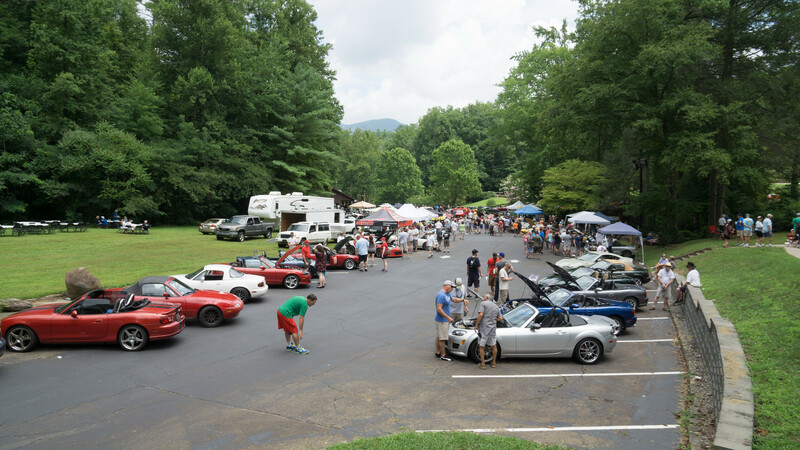 We have vendors for all types of Miata upgrades, a tent with event t-shirts and commemorative dash plaques, a schedule of organized drives, and the infamous beer and wine swap on Saturday night. There is also a General Store nearby to keep you fed and hydrated for your driving adventures while providing a great meeting point. The annual opening event for MATG. 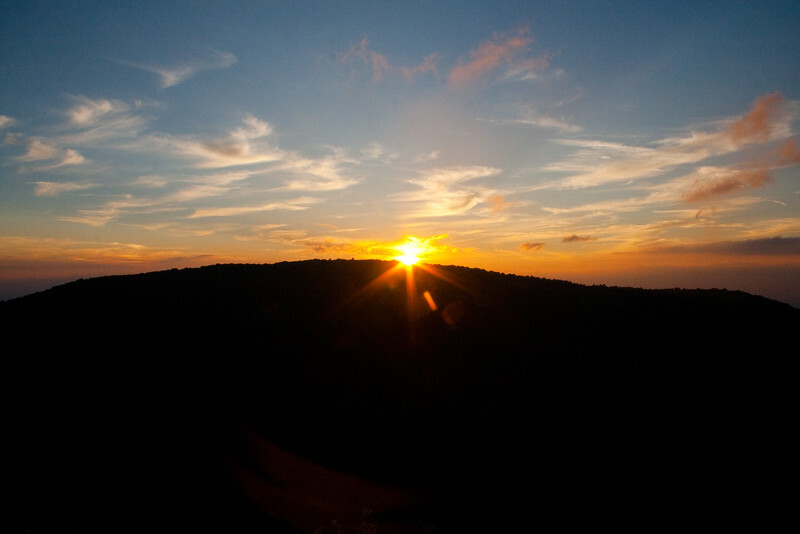 A group drive from Fontana Village, across the Cherohala Skyway to view the sunset from a breathtaking overlook. The annual spirited drive led by Ken Yarrow to various twisty roads around the area. Only 40 cars will be permitted due to traffic. Meet at the school parking lot in front of the General Store and leave at 10am SHARP. An annual lunch run to a local brewery or winery led by Mike and Sharon. We'll be heading over to Currahee Brewing Company. This run is strictly limited to the first 50 cars in line, so be there early! The Fat Buddies run across Wayah road and back on SR 28 Friday afternoon. Meet at 4:00 pm depart at 4:30 sharp. This should not be confused with the Friday Morning Spirited Run. This will be a fun run at a fun pace, but not a fast, highly spirited run. Join us for a run from Fontana to Madisonville (Tellico) over the Cherohala Skyway. There will be two different groups based on degree of spirited run. The annual photo of Miatas at the Gap. The shutter snap is at 11:00 sharp! Make sure that you're there plenty early to get a good spot in the photo. Killboy will have them available on his website for anyone to purchase at great prices. A free lunch paid for by Graham County Travel and Tourism and Fontana Tourism Development Authority in appreciation of our continued annual presence in their county. Please send them a little note to say thank you for their gratitude! A free scoop of Mayfield's Ice Cream paid for by Moss Motors. Gather your favorite local adult beverages and share them with the crowd at the 2017 MATG XXI Beer Swap and Wine Tasting! The prizes are donated items from our vendors and partners. 100% of all proceeds benefit the chosen recipient as our way of saying Thanks and showing support for our community and the community we become a part of every year. Located on Highway 28 between Fontana and Robbinsville. Owned and operated since 1967 by Ben and Barbara Crisp. They also have a convenience store and gas station. Tapoco Lodge was built in 1930 by ALCOA for workers on Cheoah Dam. The lodge consists of suites, lodge rooms and cabins. The Microtel is in the middle of Robbinsville and walking distance to grocery stores, restaurants and gas stations. Free wifi, continental breakfast and allows pets. In the center of the Fontana Village Resort on a hillside overlooking the activity fields, Gunter Cabin and the General Store sits the Wildwood Grill Restaurant. Once a game room and snack bar, the remodeled Wildwood Grill offers a warm and charming ambience, wonderful food, craft beer, wine, cocktails, and friendly service. Food options range from a wide selection of appetizers to salads, burgers, incredible sandwiches and made to order pizzas and the full menu is available for both lunch and dinner. Whether you dine on the lively patio or settle into a cozy table inside, the Wildwood Grill delivers an unequaled mountain view with regularly scheduled live music, food, and great friends! If you’re on the go, the food selections are available on a carryout basis as well for your picnic at the dam, or lunch on the Dragon, or wherever your adventure leads. Take-out on pizza and other snacks is also available. In 2004, the addition of the Dragon's Den Grill was added to Deal's Gap Motorcycle Resort. Allowing 65 guests to sit, relax, and have a great meal. Four years later, the addition of the Pub was installed, so one can enjoy a cold beer with their meal if desired. Three TV's set on weather, news, & SPEED Networks are positioned around the Grill & Pub to keep you updated on current conditions & race day shouting at the tv. Perched on the banks of the world famous Cheoah River, Tapoco Tavern combines the very best of classic pizzeria and all American flavors with a view and environment unmatched in all of Western Carolina. Order up a brick oven pizza for the family or indulge in the house favorite, “The Dam Drink” from their full-service bar. From steaks, burgers, salads, and local Carolina Mountain trout, there’s something for everyone. Established in 2013. We thought a 1950s service station themed coffee and sandwich shop would be the perfect atmosphere for the road weary Dragon slayer or the adventurous people that just crossed up on over 5000 feet on the Cherohala Skyway or Blue Ridge Parkway. With plenty of covered bike parking and a large outdoor covered eating area over looking the river, its a perfect spot to kick of your ride with fresh locally roasted coffee or to take a break from the road for some BBQ or a hot pressed sandwich. Come get your grub at The Hub! The guys from MT Motorsports will be joining us again this year. They will be bringing at least one of their Miatas with the GM Ecotec engine swapped in. Exomotive manufactures the Miata-based Exocet kit car. Imagine putting your Miata on the ultimate diet and creating a vehicle on par with supercar performance with the reliability that the MX5 is famous for. Bryan and the crew from Fab9 Tuning will be making the drive down from Michigan and will be setup in the Vendor's area. Please come visit them and check out their upgrades and tuning options for all generations of Miatas. Geri and Peter will be trekking up from Low Country to join us. Geri is the original designer and manufacturer of custom- fit Miata luggage. Hand-made items using only high quality components with custom embroidery. Geri's work is only top-notch. KMiata delivers in the form of impressive, naturally-aspirated, four cylinder power that the Miata community has long-clamored for. 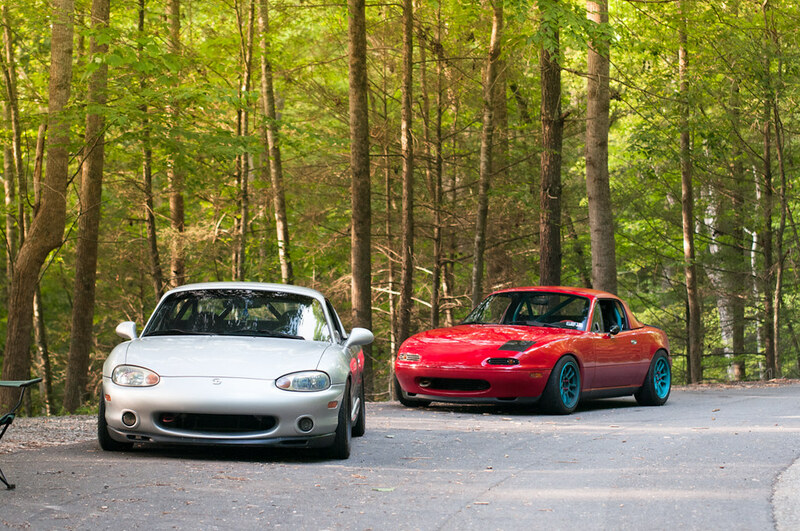 The KMiata conversion proves to be a fast, reliable all-around package. MX5 Digital is a company created by fellow enthusiasts that aims to provide a new and unique option in the Miata market. The digital cluster accurately reads speed, RPM’s, fuel, pressure, and temperature. Öhlins USA is the North American distributor and principal service center of the world’s-leading performance suspension components for motor vehicles. Paco Motorsports has been in business since 2008 providing intelligently designed, quality built, and exceptionally valued performance products for sports cars, predominantly Mazda Miatas. Palm Breeze Car Care will be at MATG again this year selling their waterless car care supplies and performing masterful detail cleaning on the spot. Drop your car off, get an ice cream cone, and then pick up your freshly cleaned and detailed Miata. Alex Todd is bringing some imported JDM goodies along with tons of Miata parts and accessories for you to purchase on-site. He also offers shipping on larger items, and has a tremendous amount of inventory in stock. Spinnywhoosh Graphics will be bringing along samples of their vinyl talents. From Miata (and other car scene) decals to window banners, large livery type applications like their Sakura kits and even autocross numbers. The guys at V8 Roadsters typically bring several different Miatas with GM V6 and V8s swapped in. They also offer custom tublar sub-frames, lightweight billet control arms, big brake kits, and suspension setups for all generations of Miatas. Dan and Carla will be joining MATG again this year and bringing some of his custom powdercoated items. You can see some samples of his craftsmanship in person at MATG on a multitude of Miatas. Superfast Miatas offers a motor swap kit to drop in a Honda J-series V6. With engines readily available in the junkyard in many different Hondas and Acuras, and most developing 240 hp in stock form, this is an excellent option to make more power. Lodging in the Deal's Gap area. Restaurants in the Deal's Gap area. Local attractions in the Deal's Gap area. A listing of the names of all the corners through Deal's Gap.